I'm actually thinking of a more creative title for this blog post; but the title, which Saizen gave it was already perfect so I just let it be. Anyway, Saizen has always been close to my heart since you know how much I and my sister, Theblacksheeproject.blogspot.com, loves the Japanese culture and having a Japanese store like Saizen here in the Philippines and get to try their stuff is just pure awesome. So when Saizen email-ed me campaign they're launching, I'm just itching to share it with you guys. Save the Environment by donating newspaper at Saizen. 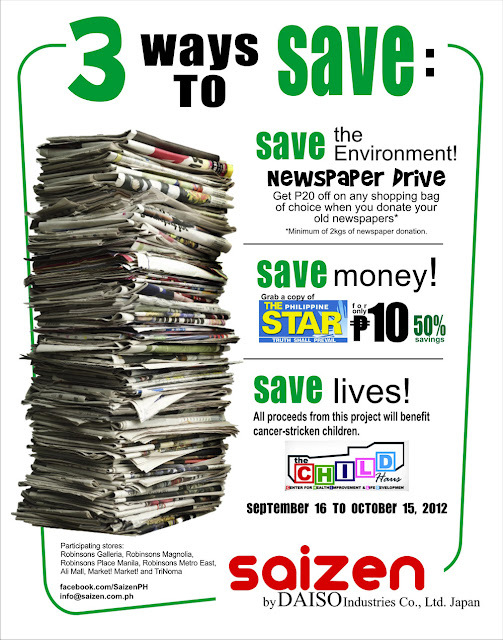 For every 2kg of Newspaper donation, Saizen is giving away a P20 discount for the Saizen shopping bag purchase at their store. Save Money by buying the Philippine Star newspaper in their participating stores for only P10. That's like 50% off! Excited? This campaign will run from September 16 - October 15, 2012 participated by Metro Manila Saizen stores: Robinsons Galleria, Robinsons Place Manila, Robinsons Magnolia, Robinsons Metro East, Ali Mall, Trinoma and Market! Market! The turnover of proceeds to CHILD Haus is on October 29, 2012.